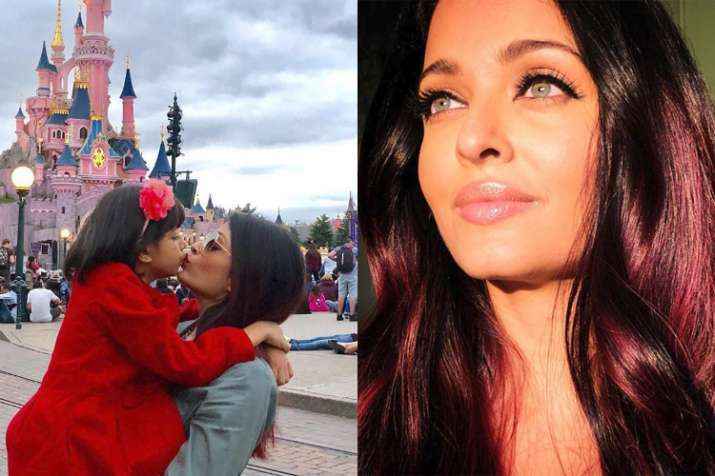 Beauty queen Aishwarya Rai Bachchan is currently vacationing in Paris with her little daughter Aaradhya Bachchan. The mother and daughter duo are enjoying their trip to the fullest and we can get a glimpse of it on Aishwarya’s each Instagram updates. Aishwarya’s little princes, Aaradhya was even seen striking a pose like her mother in a pic. And in the latest Instagram pic, Aishwarya and Aaradhya can be seen sharing a sweet kiss. Aishwarya is holding her princess in her arms and showering love on her. Aishwarya is in the French capital for an ad shoot and the diva also managed to have some fun with her little munchkin. ‘’My Princess Angel’s Happiness means the World to me My Aaradhya…My LIFE My Eternal LOVE,’’ wrote Aishwarya sharing the pic with Aaradhya on her Instagram. Aishwarya on her professional trip to Paris is accompanied by her daughter and mother. The trio Aishwarya, her daughter and her mother are having gala time in the French capital. And all her fun moment in Paris can be seen in the series of pics shared by Aishwarya on Instagram. On professional front, Aishwarya is gearing up for the release of Rajkummar Rao and Anil Kapoor starrer Fanney Khan. The trailer of the film dropped on the online platform recently and it was appreciated by fans. A song titled Mohabbat from Fanney Khan, which released today also received positive response of audience.